Maximises battery runtime and safety. MICROCHIP Technology has released an integrated, field-reprogrammable fuel gauge for two, three and four-cell lithium ion (Li-Ion) and lithium polymer (Li-Poly), or six to 12-cell nickel metal hydride (NiMH) and nickel cadmium (NiCD) batteries. The smart battery system (SBS)-compliant device provides precise predictions of battery capacity. It offers cell monitoring for safety conditions along with end of discharge (EOD) control, maximising battery life and runtime. The PS501 battery-manager IC combines the PIC18 microcontroller core with its Accuron algorithm stored in 16-Kbytes of on-chip Flash memory. The battery-manager offers an operating current of 150μA. When not in use the device enters a sleep mode using less than 1μA, which optimises the capacity and minimises over-discharge of the battery. A 16-bit programmable, sigma-delta integrating A/D converter and application-optimised mixed-signal circuitry are also included. This enables measurement of battery current, temperature and voltage as well as direct connection of up to four-series cell lithium-ion or lithium-polymer packs. 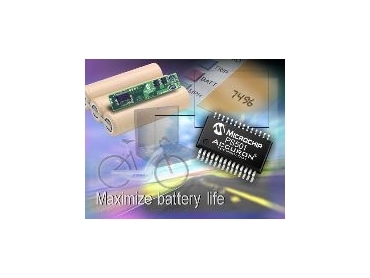 On-chip EEPROM provides storage of user-customisable battery parameters. The PS501 battery-manager has an accurate silicon oscillator, eliminating the need for an external crystal. Hardware and algorithms are integrated for cell balancing. Twelve general-purpose pins support charge and safety control or user programmable digital I/O. Eight of them can be used as LED drivers and two are open drain for direct FET drive. Communication with the host is compliant with the industry-standard SMbus protocol and all Sbdata parameters are supported. Development system availability for the PS501 battery-manager includes the PS5164EV for the four-series cell, the PS5163EV for the three-series cell and the PS5162EV for the two-series cell battery pack for Li-Ion or Li-Poly. For NiMH and NiCD, the PS5200EV is available. This can be configured for six to 12 cells in series. This development system includes an application board, PowerInfo 2 interface board (PS051) and the accompanying cables and documents. Windows-based PowerTool 2 (PS050) software with embedded wizard allows optimization of application and battery-specific parameters during evaluation and development as well as production support such as custom programming and calibration of a PS501 application board.